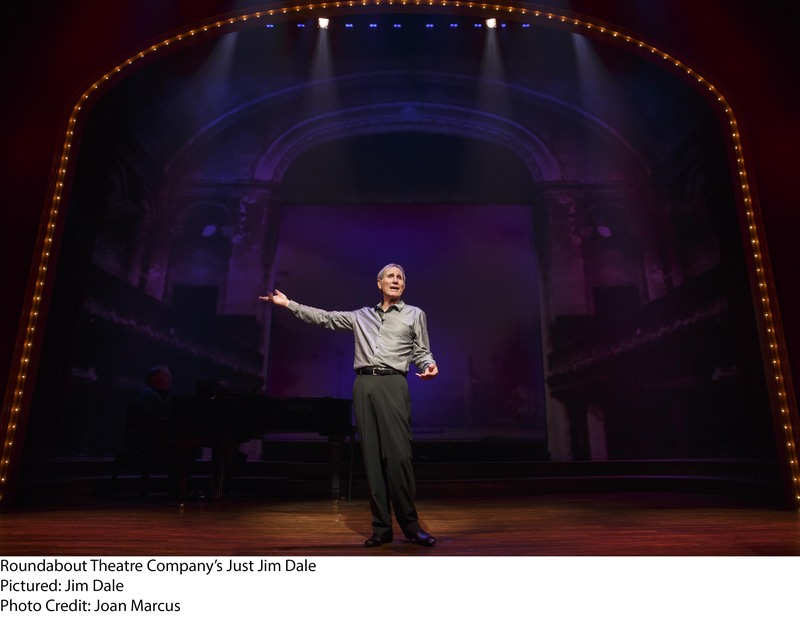 The Roundabout gives us just Jim Dale -- casually attired in gray trousers, gray shirt and gray hair, on an empty stage but for a baby grand piano -- in their latest offering at the Laura Pels. Dale is trim, slight, and approaching eighty, but he turns out to be more than enough to fill the stage entertainment-wise. 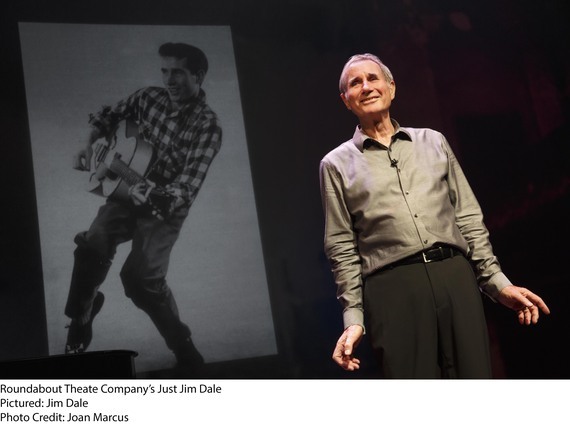 Simply put, Just Jim Dale is unalloyed joy, starring the self-proclaimed "hosted, toasted, roasted lucky Jim." Young Jim Smith hailed from middle-of-nowhere Rothwell, a factory town with no room for advancement nor prospects. The bright spot of his existence, he tells us, was the local music hall. At seventeen, he escaped by clowning his way into a traveling troupe of teen talent, landing his spot by lacing his act with pratfalls (billed as "Jimmy Smith, the Laff Smith"). As music hall started to die out in the late '50s, the twenty-ish Dale became a chart-topping rock 'n' roller, with his recordings produced by a pre-Beatles George Martin. Dale's song-writing career peaked with the Oscar-nominated lyrics for the title song of the 1966 film, Georgy Girl. All of this is related in song -- songs from Dale's career, or existing songs with new lyrics by Dale -- and story. The star makes it look effortlessly simple, weaving his tales and adventures into gloriously funny set-pieces. He has made a side career as reader of the phenomenally-successful Harry Potter audiobooks; he clearly knows how to tell a tale. Among the set pieces are a pas de deux by eleven-year-old Jimmy with his cousin Ruth, except she fails to appear; a nimble-tongued spiel of familiar phrases from Shakespeare; an audition of the song Georgy Girl, for two Godfather-style gangsters; a monologue from Noël Coward's play Fumed Oak; an audience participation scene from A Day in the Death of Joe Egg, which Dale memorably played for the Roundabout in 1985; and a mélange of Potter voices. Dale is accompanied by pianist Mark York, on a simple but elegant set from Anna Louizos. Richard Maltby, Jr. directed the show, which was originally mounted at the Long Wharf in New Haven in 2012. Special attention is given to Dale's Broadway appearances. He tells us how the first musical he saw as a child--a West End revival of Me and My Girl, starring Lupino Lane -- instantly made him want to be a performer, and forty years later he was himself on Broadway, "doin' the Lambeth Walk, oi!" (Dale grew up in Northamptonshire, far from the London district of Lambeth, but no matter.) Just Jim Dale also reprises three selections from Barnum, the 1980 musical for which he won a Tony Award: "There's a Sucker Born Every Minute" and "The Museum Song" showing off Dale's vocal dexterity, and "The Colors of My Life" as a salute to his wife. Dale also pauses to mention Scapino, the 1974 treat with which the talented Englishman veritably exploded on Broadway. Those of us who saw this Dale/Frank Dunlop adaptation of Moliere's Scapin, at the Circle in the Square or Ambassador Theatre, are still marveling over Dale swinging through the air on a rope brandishing an oversized salami. It is a supreme pleasure, for at least some of us, to hear him once more sing his Neapolitan "Minestrone, Macaroni" song.